The “fascist shift”, as described by author Naomi Wolf in The End Of America/ Letter Of Warning To A Young Patriot, is accelerating in Canada with the tabling of (“State Terror”) Bill C-51. Though universally condemned by experts, and increasingly unpopular amongst Canadians, the Bill will almost certainly pass, as common sense and public opinion become the first casualties of Canada’s fascistic governance. The Harper government has manipulatively invoked the threat of ISIS to create unreasonable societal fear, so that it can advance an imperial agenda beneath the cover of lies and deceptions. There are simply too many holes in the official ISIS narrative to accept it at face value. There exists too much contradictory evidence of the West supplying ISIS with weapons and foodstuffs, and of the West not being “serious” about destroying ISIS — in addition to the fact that the West and ISIS share common goals: namely, the conquest of Syria and further destabilization of the Middle East – to unquestionably believe the official government narrative. “The Global War on Terrorism has become a consensus. It is part of war propaganda. It is also used by Western governments to justify and implement ‘anti-terrorist’ legislation. It is the cornerstone of the West’s demonization campaign directed against Muslims. But the unreasonable fear creates the pre-conditions for the government to impose Police State legislation on a compliant public that seeks “protection”. Peaceful human rights advocates such as Drs. Pam Palmater and Cindy Blackstock are already being targeted and surveilled, at considerable expense, and for no legitimate reason, yet Bill C-51 promises to become even more intrusive and repressive. Blackstock is an activist for child welfare as well as Executive Director of the First Nations Child and Family Caring Society of Canada. Palmater is a lawyer and university professor who is an activist for First Nations causes. Surveillance of law-abiding citizens, under the watchful eye of “Thought Police” has the effect of putting a “chill” on freedoms of expression and assembly as guaranteed by Canada’s Charter of Rights. It is not consistent with free and democratic societies, but it is yet another hallmark of Police State repression. 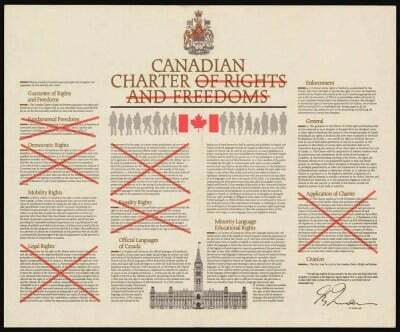 Bill C-51 violates Section 35 of Canada’s Constitution by negating and denying rather than recognizing and affirming aboriginal and treaty rights. First Nations have not been adequately consulted according to Canadian law. Additionally, Bill C-51 derogates international rights. According to the United Nations Declaration on the Rights of Indigenous Peoples (UNDRIP), issues that impact First Nations (such as Bill C-51) require the Free Prior Informed Consent (FPIC) of the impacted communities. Theoretically, then, an individual who exercises his/her freedom of dissent, and freedom to resist could be falsely branded in catch-all terms such as “terrorism”, or “espionage”, or even “treason”. The press has long been compromised by corporate monopoly ownership, but now public media is increasingly compromised as well, so much so that media has basically become an “arm of the government”. A December 11, 2014 article entitled “The Conservative Broadcasting Corporation” , for example, shows that membership of the government-appointed Board Of Directors for the Canadian Broadcasting Corporation (CBC), is dominated by people who are, or have been, financial contributors to the reigning Conservative Party of Canada. Each of these “covert” strategies pollutes the collective mindset of the population in favour of the state, and makes a mockery of the notion of “freedom of the press”. Vague definitions of “terrorism” coupled with lowered standards for legitimate detention as outlined in Bill C-51 means that seemingly “one-off” debacles such as the mass arrests of demonstrators during the G-20 protests, described by the Canadian Civil Liberties Association (CCLA) as “unprecedented, disproportionate, and, at times unconstitutional”, could theoretically be “normalized”. The threat of arbitrary detention and release is an impediment to freedoms of peaceful assembly, and freedom of expression, and another sign of a closing society. The threat of agents provocateurs who infiltrate citizen groups also serves to stifle people from exercising their rights, as it puts a chill on peaceful demonstrations. Such actions, closely related to false flag operations, also serve to deny citizens of their rights of freedom of expression and peaceful assembly – two enemies of closing societies. Private, para-military agencies are making inroads into Canada’s military and security apparatuses. According to a National Post article, “Notorious security contractor Blackwater trained Canadian troops without U.S. permission: court documents”, dated August 8, 2012, Blackwater/Academi has had an untendered contract with Canada since 2006 for training to Special Operations troops and some police. More recently, a Blackwater/Academi employee informed me, (in person), that his company will be providing security for the 2015 Pan Am Games in Ontario, Canada. On the surface, what we know about the integration of para-military forces such as Academi into Canada’s military/security apparatuses seems fairly innocuous, however, para-military forces such as Blackwater/Academi have a huge presence overseas, and their covert operations, often with little oversight, and considerable immunity from prosecution, are increasingly involved in assignments that, until recently, would have fallen under the exclusive domain of the military. Fascistic governments typically employ para military forces to create a buffer (of plausible deniability) to compromise transparency and accountability. Such is the danger when countries hire covert para-military forces, often beneath the radar, to advance their agendas. One final hallmark of the fascist shift as identified by Naomi Wolf, is the establishment of secret prisons. Since the U.S has “black sites” throughout the world, Canada’s increasing “harmonization” with her ally, in terms of cross border policing and military operations abroad, raises red flags. If our closest allies use gulags/black sites, are we not at least indirectly implicated? While we may not yet have our own secret prisons, it would seem that we have used “secret prisons” abroad, to detain and torture innocent civilians. Clearly, Canada’s fascist shift is in high gear, and Bill C-51, once passed, will put us in overdrive. How will we ever be able to pull ourselves free of the mess that we’ve made? Mark Taliano is Citizen Editor at Daily Clout.